In December, 1984, thousands of people died following the release of a toxic chemical (methyl isocyanate) at a Union Carbide plant in Bhopal, India. This tragedy was followed by the disclosure one month later that the same chemical had leaked in smaller quantities at least 28 times from a similar Union Carbide facility in Institute, West Virginia. Eight months later, 3800 pounds of leaked chemicals from the same Institute plant sent dozens of injured people to local hospitals [NYT 1985a, NAP 1989a]. Following the tragedy in India and the realization that a similar disaster was possible in the United States, Congress passed the Emergency Planning and Community Right-to-Know Act (EPCRA) in 1986 as Title III of the Superfund Amendments and Reauthorization Act (SARA). This legislation requires manufacturing facilities handling toxic chemicals to have emergency plans and coordinators in place in case accidents occur. Additionally, it requires facilities to inform communities and local authorities about the hazardous chemicals handled. Finally, the Act requires facilities to publicly report their chemical waste and emissions, a provision under Section 313 of the Act known as the Toxics Release Inventory (TRI) [EPA 2004a, EPRCA]. The Toxics Release Inventory (TRI) has become the nation's premiere right-to-know initiative. It is one of the most widely praised—and successful—environmental programs for industry, environmentalists, and the public. Each year, companies across a wide range of industries (including chemical, mining, paper, oil and gas industries) that produce more than 25,000 pounds or handle more than 10,000 pounds of a listed toxic chemical must report it to the TRI. When the TRI first when into effect, the threshhold was 75,000 pounds annually. If the company treats, recycles, disposes, or releases more than 500 pounds of that chemical into the environment (as opposed to just handling it), then they must provide a detailed inventory of that chemical's inventory. In 1990 the TRI was expanded with passage of the Pollution Prevention Act to include data on chemical quantities and practices involved in source reduction and recycling. In 1993 President Clinton issued an Executive Order in response to an evaluation of TRI by the General Accounting Office, which further expanded the program to require reporting from federal facilities [EPA 2002c]. 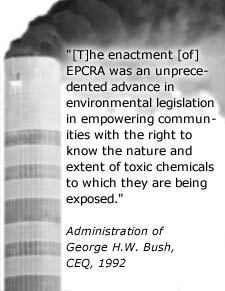 EPA then reduced certain reporting requirements in 1994 when it established a system of different "forms" to be submitted for different levels of chemical releases [EPA 1994a]. Larger releases now require more detailed reporting, while smaller releases require more basic reporting. In 1997 TRI was again expanded when EPA mandated more complete data on emissions from incinerators, and required TRI emissions reporting from additional industries not previously included: metal and coal mining, commercial electric utilities that use coal or oil, commercial hazardous waste treatment facilities, petroleum bulk terminals and plants, chemical and allied product wholesalers, and solvent recovery services [EPA 1997a]. This information showed, for example, that hardrock mining is the biggest polluter in the U.S., accounting for approximately half of all toxics releases in the TRI. However, subsequent heavy pressure from the mining industry to eliminate the public right-to-know about their releases yielded some reporting exemptions for certain kinds of mining waste [Earthworks 2005a]. Delivering important information on pollution to communities near industrial facilities. With annual emissions reporting from over 23,000 industrial and federal facilities, the TRI is credited with dropping the total releases of chemicals from all sources by 65 percent since 1989 [Hogue 2005]. The TRI database has provided a foundation of facts to inform and drive policy improvements at the national, state, and local levels. In 2005, TRI data was critical to passage of a new clear-air program in Louisville, Kentucky [UCS 2005a]. In Massachusetts, the JSI Center for Environmental Health Studies (with support from National Network of Libraries of Medicine) conducted a pilot training program on using the TRI to address local concerns. The project was so successful that it is being disseminated to other New England communities [OMBWatch 2005a]. In Minnesota, a workers' union and citizens' groups used TRI data in 1990 to successfully negotiate a new contract with Sheldahl, Inc. to reduce airborne carcinogen emissions by 90 percent over three years [UCS 2005a]. In a 2003 report, the EPA highlighted at least 20 state governments that rely on the TRI program for emergency planning, environmental targeting, risk assessments, standards, legislation, and quality assurance and control [EPA 2003a]. And TRI data has been key to community efforts to reduce pollution in "Cancer Alley" and Lake Charles, Louisiana, the very areas that face chemical challenges in the devastating aftermath of the 2005 hurricanes. As the Union of Concerned Scientists notes, "The Gulf Coast emergency highlights the need for more—not less—information on the release of chemical hazards in order to help us to prepare for any future disasters." [UCS 2005a]. Not surprisingly, the TRI is popular with the public, as demonstrated by public responses to government proposals to roll back the program in the past. The TRI's popularity is consistent with findings from public opinion polls showing that the public considers access to pollution information to be a basic right [Mellman 1999a]. Anyone may petition the EPA to add or delete chemicals from the TRI reporting list. EPA has the authority to revise reporting thresholds for chemicals on that list as long as these revisions still require reporting that constitutes a substantial majority of the total pollution associated with that chemical. Using this authority the EPA finalized special reporting requirements for persistent bioaccumulative toxic (PBT) chemicals in October 1999 based on the ability of these compounds to cause long-lasting harm to wildlife, ecosystems, and in many cases, humans at low levels of exposure. Since reporting year 2000, EPA has required facilities to submit full TRI reports if the facilities manufacture or use any of these PBTs in quantities of at least 100 pounds, or even less for some compounds. For all other chemicals covered by the TRI program, facilities must submit TRI reports only when they handle at least 10,000 pounds a year, manufacture 25,000 pounds per year, or discharge or dispose of at least 500 pounds per year.